Al-Kimia is a journal of chemistry that published by Department of Chemistry, Faculty of Science and Technology UIN Alauddin Makassar. The journal is published twice a year on January-June and July-December. This journal encompasses original research articles in all aspects of chemistry and related area. The journal, which was firstly published in July 2013, is a forum for communication of research results, review the results of research, methodologies and new approaches in research related to chemistry in Indonesia. 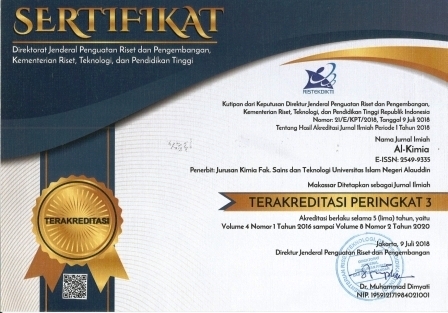 The Journal has been accredited by Akreditasi Jurnal Nasional (ARJUNA) officially Managed by Ministry of Research, Technology, and Higher Education, Republic Indonesia with Third Grade (SINTA 3) since year 2017 to 2021 according to the decree No. 21/E/KPT/2018.